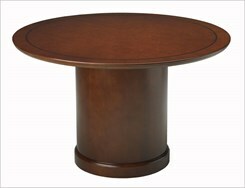 Sorrento Espresso Tables - FREE SHIPPING! IN STOCK! Our Sorrento Espresso Finish Rectangular conference tables are far beyond the ordinary. Priced for the small business yet offering the appearance desired by the largest corporations. 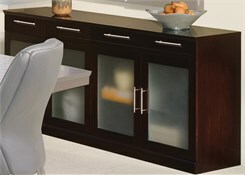 Craftsmanship is evident in the multi-species hardwood veneers and incredible attention to detail. Solid surface and base structures give the line a solid and substantial feel yet don't cost a fortune. Sorrento conference tables convey your excellent taste and the look of success. 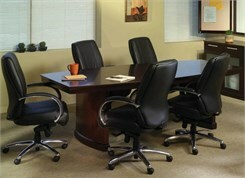 Offered in sizes to accommodate the smallest private conference room to the largest boardroom. 6' Espresso Boat-Shaped Conference Table (inset photo) sold above. Other sizes sold below. 1 piece top. Measures 72"W x 36"D x 29-1/2"H overall. Shpg. wt. 231 lbs. All tables are feature a lustrous Espresso finish on AA-grade, North American walnut veneers. PRICE INCLUDES SHIPPING! (Truck shipment - See Terms & Conditions). Please allow 1 week for delivery. 1 piece top. Measures 96"W x 42"D x 29-1/2"H overall. Shpg. wt. 281 lbs. PRICE INCLUDES SHIPPING! (Truck shipment - See Terms & Conditions). 3 piece top. Chairs sold separately. Measures 216"W x 54"D x 29-1/2"H overall. Shpg. wt. 667 lbs. PRICE INCLUDES SHIPPING! (Truck shipment - See Terms & Conditions). 5 piece top. 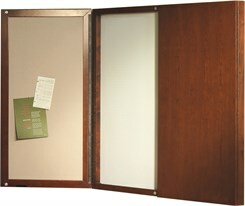 Measures 360"W x 54"D x 29-1/2"H overall. Shpg. wt. 973 lbs. PRICE INCLUDES SHIPPING! (Truck shipment - See Terms & Conditions).